Marsupilami is a fictional comic book species created by Andre Franquin, first published on 31 January 1952 in the Franco-Belgian comics magazine Spirou. After that you can take your yarns and hook and make one for yourself and have fun every day watching this silly creature gooofing around your room with his silly face, long bouncing ears and tail. Marsupilami was done few weeks ago, but was waiting for my friends from the Facebook group to finish trying out the pattern so the final pattern comes out with as little mistakes as possible. One more look of to Marsupilami and we can get started with the pattern. Cluster stich – 2dc under same stitch; follow the link for explanation and how to. Work is done in continuous rounds (spiral work). Use marker for easier round following. Stuff the head nice and firm. Tie off. Stuff the head some more if needed. Stuff the fingers at this point. R12 sc7, ch1 fold the last row in half and slip stitch through 7 stitches (this can be difficult as the piece is small, if you find it easier, you can sew the back instead). What we have done here, is closed the foot. Now it is round, opened only on top side, where we’ll continue with crocheting the leg. Reaching the end – closing the back of the foot (after 7 sts made) change color to yellow. Add more stuffing to the foot and continue stuffing the leg as you go. Note: to add knees make 3cluster stitches (each with 2dc) in the front area of the round 19. At the end of R28 tie off and cut ends. This leg we have just made was right side one. Start making leg as written above. Changes on the pattern will start at R8. Continue with the pattern as written above, but don’t cut the thread and tie off. Stuff the body nice and firm. Finish stuffing the body. Ad some more stuffing at the time when sewing head and body together to make the neck part nice and firm. Each hand will have four fingers. Middle finger is one round longer. Stuff the hand and continue stuffing the arm as you go. To add elbows, make 3 cluster stitches with 2dc each. Add them around rounds17-18. Tie off leaving long end for sewing. Black pupils are placed in the inner sides of eyes, between rows 2-3. I have painted mine, but if you are using safety eyes or beads this is the place where to position them. White eye parts are placed next to each other on the upper half side of the head. (eyes and mouth piece will meet on the middle of the head (so pay attention to that). Nose will be placed the way to touch the outer eye line and will go through 4-5 rounds over the mouth piece. Tie off leaving long end for sewing the nose on the head. Stuff the nose well. Place and sew the nose as described above. Flatten the ears, tie off leaving long end for sewing them on the head later. Position the belly on the lower side of the body and sew it nicely. R1-… make tail as long as you like using 6sc Marsupilami has very long tail. I suggest making it 26 cm (12”). That size won’t make it too long and will still be nice and long. Last 5 rounds *inc1, sc2* x2 (8 sts), next 4rounds stitch 8sc for firmer tail body connection. Time to sew all body parts together. Connect head and body. Sew on the arms. Place them around rounds 24-25. Round 25 needs to be left free as you will put additional hairs here to create fur around neck. At the end place on and sew the ears. Sew them on top sides of the head, rounds 5-6. When sewing use one round stitches on the head and sew through both loops of the ears. Try to make them point upwards so ears can appear fluffy and in motion. At the end sew the tail on. Position it centered on the lower back side of the body, 5-6 rounds upwards from feet connected round. What is left is to embroider black spots on it’s body. Making fur around neck (arms and legs) is optional. As you could see, I left front loops on arms, legs and around neck area. I have put on these extra hairs around neck only. It is done as making hair. You will hook and knot yarn pieces through front loops, and when all done, trim it in V shape (longer points in front and back). I have also added a fish Marsupilami holds in his hand. You can add it as well if you wish. We have to finish our toy with one more tiny detail and it is fish Marsupilami is holding. From next round we’ll start decreasing so start stuffing the body as you go. By now fish should be stuffed well. Tie off leaving long end for sewing. Thread the needle with excess yarn and close the last round nicely. Repeat at both sides paying attention to make them as symmetrical as possible. With white yarn and embroidery needle sew on the eyes. With black thread ad pupils on top of each eye. Hope the fish was not difficult to make and it ended up cute. And that’s it! 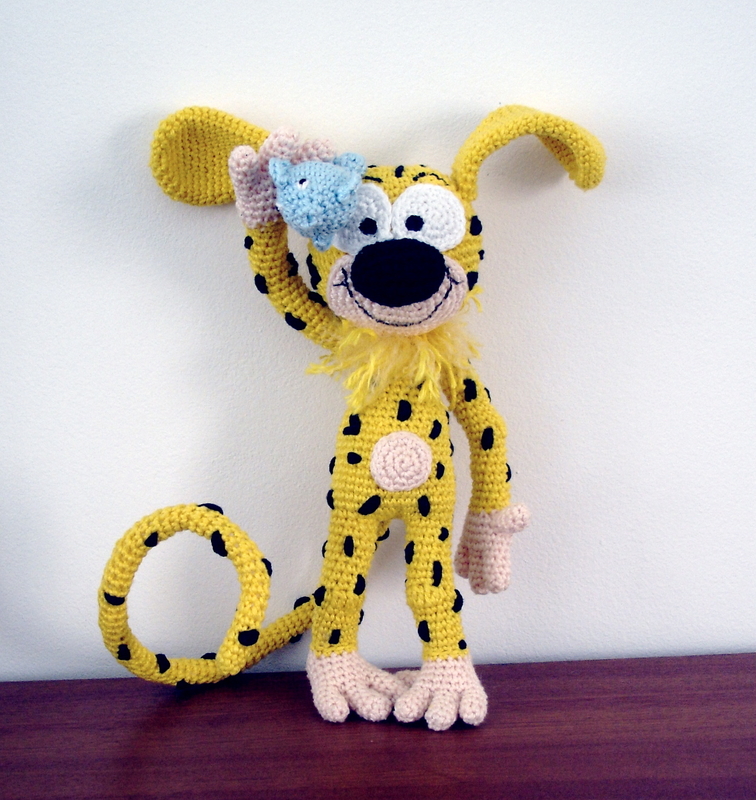 Your Marsupilami is finished! Hope you have enjoyed making him and even more will enjoy playing! I think I may have posted my question on the wrong page. I’m having a problem with the legs of Marsupilami. On round 12 of the feet, after I have the toes connected and I fold the last row in half and slip stitch through 7 stitches, it is not round and opened only on top side. I have no place to continue crocheting the leg. Love all you patterns and any help on this would be greatly appreciated. That should be the point to have only the top part of the leg opened, so you can continue with the leg. Round 12 of the foot is your last round, or closing round of foot making. After you finish the foot, you will continue with crocheting upwards, where opening is and start with leg. Hope it makes sense. You can send me photo of piece you’ve done so far, and maybe seeing it I can tell you more and clearer. Thank you very much for the pattern. I am doing it for my song but in black. I don’t understand how to do the feet from R5 to R12. Can you help me with picture or more explanation? Don’t think I have any photos on how to join fingers. Will have to make some. But before I do make photo tutorial will try to give you brief description. What you have to do is connect fingers. Think of them as each having two sides, and each side of 3 stitches. Once you start connecting them, you bring finger to your work and make single crochets over three stitches, then you bring next one, and again 3 single crochets there….continue until all fingers are connected. Having last finger on, and connected over 3 stitches, you can continue with opposite side. Opposite side will be the one you haven’t stitched yet. Each finger will have remaining 3 unworked stitches on, and now you have to work them too. One by one, work each stitch with single crochets. 3 sc on each finger until you reach the end, or your start of the round. next round should be easy. When you reach the round where thumb will be added. You will do the same. The only exception is that each of first three stitches (when thumb is added) have to be done through thumb stitch and you base (working piece). Think of it as going through two stitches at the same time. Repeat this for all three stitches, then continue crocheting through one stitch (as you did all the way). Next round over thumb; forget about base, and work over unworked stitches on thumb. Hope it makes sense, and hope I haven’t made it to complicated. let me know if I ca assist you some more. I will try to make photo tutorial soon. Thank you. i will try again with your description. Thank you Maz! Thanks for finding time to visit and even more to leave comment. Thank you Pinar for the link! Going to check it out right away!